Jericho (/ˈdʒɛrɪkoʊ/; Arabic: أريحا‎ Arīḥā [ʔaˈriːħaː] ( listen); Hebrew: יְרִיחוֹ‬ Yeriḥo) is a city in the Palestinian Territories and is located near the Jordan River in the West Bank. 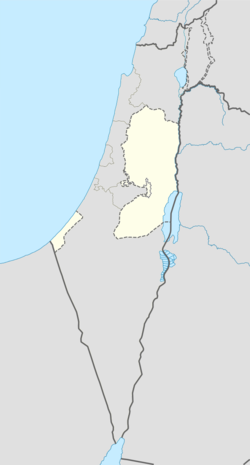 It is the administrative seat of the Jericho Governorate, and is governed by the Fatah faction of the Palestinian National Authority. In 2007, it had a population of 18,346. 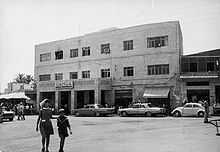 The city was occupied by Jordan from 1949 to 1967, and has been held under Israeli occupation since 1967; administrative control was handed over to the Palestinian Authority in 1994. 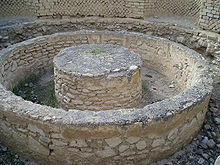 It is believed to be one of the oldest inhabited cities in the world and the city with the oldest known protective wall in the world. It was thought to have the oldest stone tower in the world as well, but excavations at Tell Qaramel in Syria have discovered stone towers that are even older. Jacobs, Paul F. (2000). 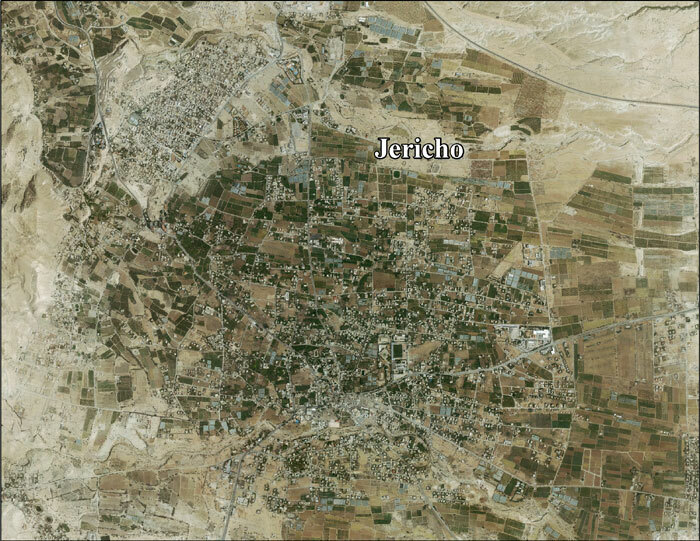 "Jericho". In Freedman, David Noel; Myers, Allen C. Eerdmans Dictionary of the Bible. Eerdmans. Singer, Amy (2002). Constructing Ottoman Beneficence: An Imperial Soup Kitchen in Jerusalem. Albany: State University of New York Press. ISBN 0-7914-5352-9. 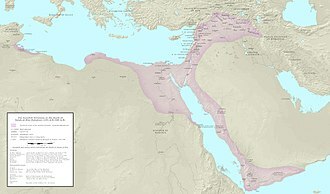 The Fatimid Caliphate was an Ismaili Shia Islamic caliphate that spanned a large area of North Africa, from the Red Sea in the east to the Atlantic Ocean in the west. The dynasty ruled across the Mediterranean coast of Africa and ultimately made Egypt the centre of the caliphate, at its height the caliphate included in addition to Egypt varying areas of the Maghreb, Sicily, the Levant, and Hijaz. 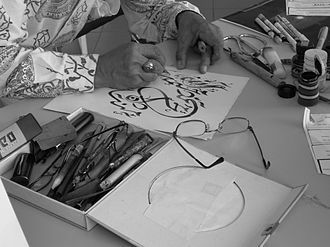 The Fatimids claimed descent from Fatima bint Muhammad, the daughter of Islamic prophet Muhammad, in 921 the Fatimids established the Tunisian city of Mahdia as their new capital. 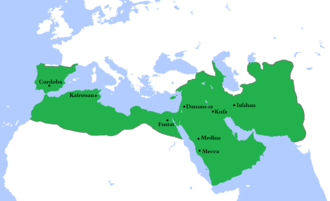 In 948 they shifted their capital to Al-Mansuriya, near Kairouan in Tunisia, in 969 they conquered Egypt and established Cairo as the capital of their caliphate, Egypt became the political and religious centre of their empire. The ruling class belonged to the Ismaili branch of Shiism, as did the leaders of the dynasty, the existence of the caliphate marked the only time the descendants of Ali through Fatimah were united to any degree and the name Fatimid refers to Fatimah. 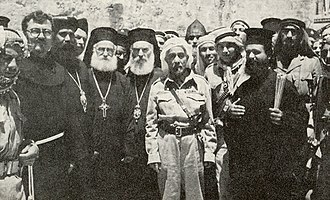 The different term Fatimite is sometimes used to refer to the caliphates subjects, after the initial conquests, the caliphate often allowed a degree of religious tolerance towards non-Ismaili sects of Islam, as well as to Jews, Maltese Christians, and Egyptian Coptic Christians. The Fatimid caliphate was distinguished by the role of Berbers in its initial establishment and in helping its development, especially on the military. During the late eleventh and twelfth centuries the Fatimid caliphate declined rapidly and he founded the Ayyubid dynasty and incorporated the Fatimid state into the Abbasid Caliphate. 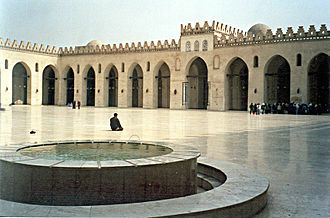 The Fatimid regime lasted until the twelfth century, though its leaders made little headway in persuading the Egyptian population. 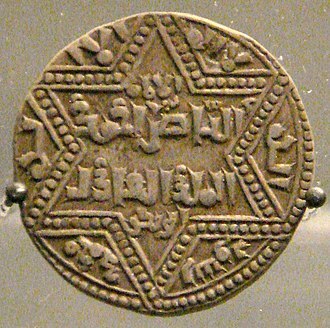 The Fatimid Caliphates religious ideology originated in an Ismaili Shia movement launched in the 9th century in Salamiyah, Syria by their eighth Imam and he claimed descent through Ismail, the seventh Ismaili Imam, from Fatimah and her husband ʻAlī ibn-Abī-Tālib, the first Shīʻa Imām. Thus his name was al-Fātimiyyūn Fatimid, the eighth to tenth Imams, remained hidden and worked for the movement against the periods times rulers. According to legend and his son were fulfilling a prophecy that the mahdi would come from Mesopotamia to Sijilmasa. 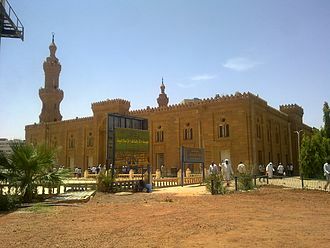 They hid among the population of Sijilmasa, an independent emirate, for four years under the countenance of the Midrar rulers, al-Mahdi was supported by dedicated Shiite Abu Abdullah al-Shii, and al-Shii started his preaching after he encountered a group of Muslim North African during his hajj. These men bragged about the country of the Kutama in western Ifriqiya, and the hostility of the Kutama towards, and their independence from. This triggered al-Shii to travel to the region, where he started to preach the Ismaili doctrine, the Berber peasants, who had been oppressed for decades by the corrupt Aghlabid rule, would prove themselves to be a perfect basis for sedition. Instantly, al-Shii began conquering cities in the region, first Mila, Sétif and eventually Raqqada, in 909 Al-Shii sent a large expedition force to rescue the Mahdi, conquering the Khariji state of Tahert on its way there. Following elections in 2006 and the subsequent Gaza conflict between the Fatah and Hamas parties, its authority had extended only in areas A and B of the West Bank. 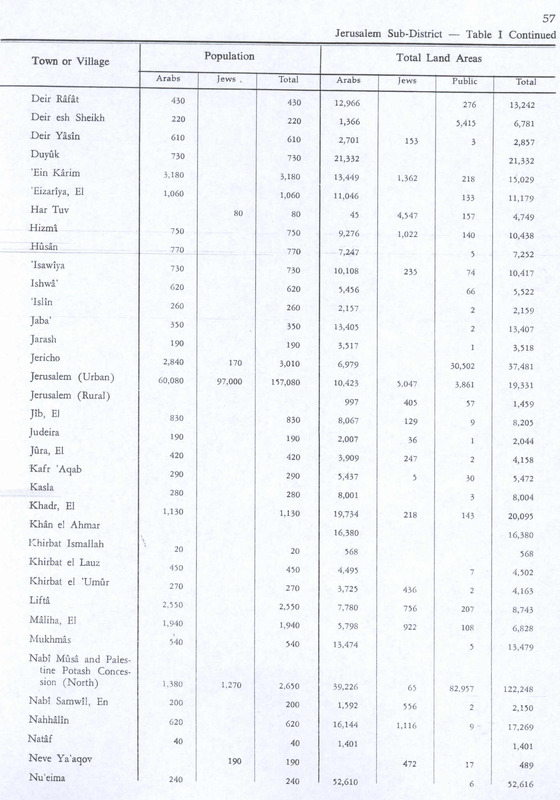 Since January 2013, the Fatah-controlled Palestinian Authority uses the name State of Palestine on official documents, the Palestinian Authority was formed in 1994, pursuant to the Oslo Accords between the Palestine Liberation Organization and the government of Israel, as a five-year interim body. Further negotiations were meant to place between the two parties regarding its final status. The remainder of the territories, including Israeli settlements, the Jordan Valley region, East Jerusalem was excluded from the Accords. 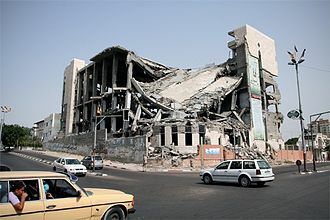 In the Palestinian legislative elections on 25 January 2006, Hamas emerged victorious, the national unity Palestinian government effectively collapsed, when a violent conflict between Hamas and Fatah erupted, mainly in the Gaza Strip. The move wasnt recognized by Hamas, thus resulting in two separate administrations – the Fatah-led Palestinian Authority in the West Bank and a rival Hamas government in the Gaza Strip. The reconciliation process to unite the Palestinian governments achieved some progress over the years, the PA received financial assistance from the European Union and the United States. 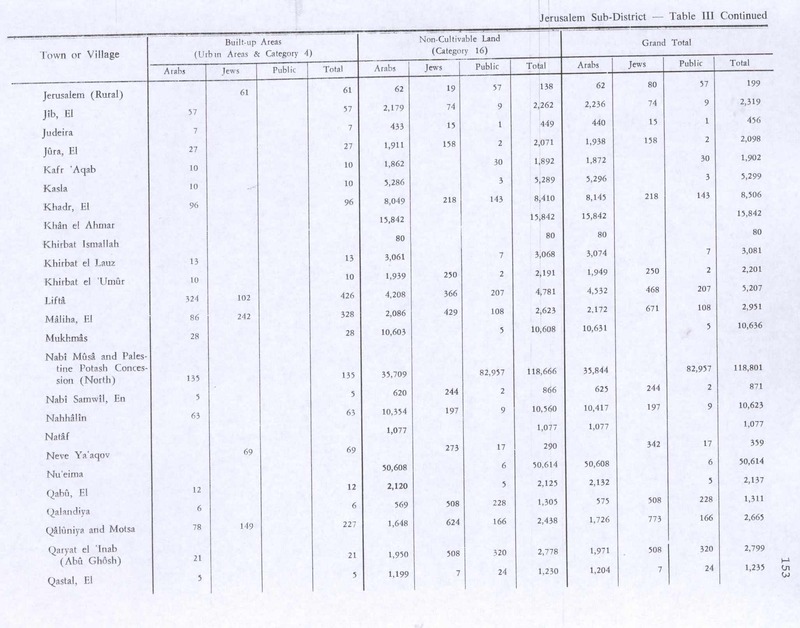 All direct aid was suspended on 7 April 2006, as a result of the Hamas victory in parliamentary elections, shortly thereafter, aid payments resumed, but were channeled directly to the offices of Mahmoud Abbas in the West Bank. In November 2012, the United Nations voted to recognize Palestine as a non-member UN observer state, the Palestinian Authority was created by the Gaza–Jericho Agreement, pursuant to the 1993 Oslo Accords. The administrative responsibilities accorded to the PA were limited to civil matters and internal security, Palestinians in the diaspora and inside Israel were not eligible to vote in elections for the offices of the Palestinian Authority. 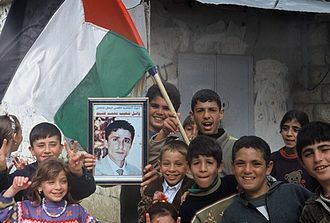 General elections were held for its first legislative body, the Palestinian Legislative Council, the expiration of the bodys term was 4 May 1999, but elections were not held because of the prevailing coercive situation. Bush stated that the establishment of a Palestinian state by the end of 2005 was unlikely due to instability and we will give the Palestinian Authority technical help by sending equipment, training people. We will give the Palestinian Authority helicopters and communication equipment, the Palestinian Authority became responsible for civil administration in some rural areas, as well as security in the major cities of the West Bank and the Gaza Strip. 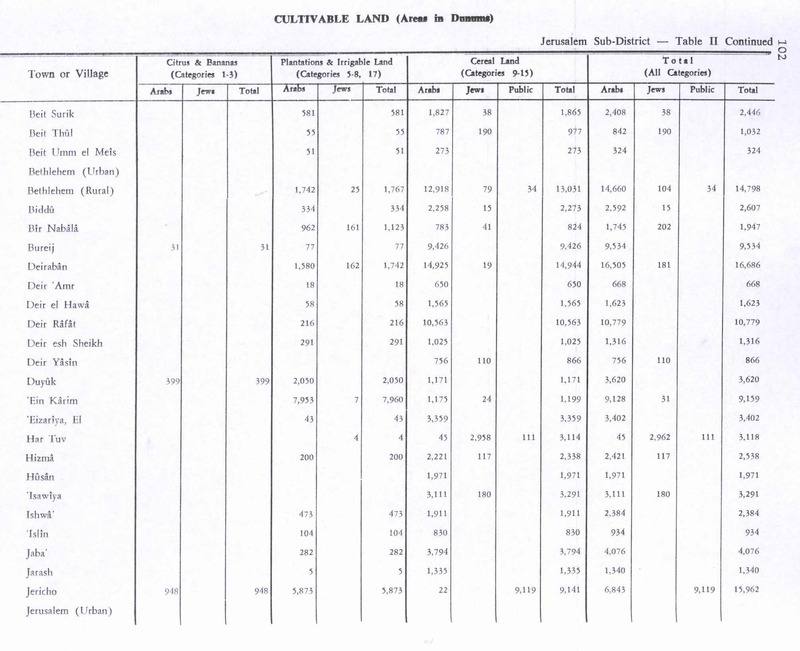 This increased the percentage of land in the Gaza Strip nominally governed by the PA from 60 percent to 100 percent, Palestinian legislative elections took place on 25 January 2006. Hamas was victorious and Ismail Haniyeh was nominated as Prime Minister on 16 February 2006, Hamas rejected these demands, which resulted in the Quartet suspension of its foreign assistance program and Israel imposed economic sanctions. In an attempt to resolve the financial and diplomatic impasse, the Hamas-led government together with Fatah Chairman Mahmoud Abbas agreed to form a unity government, as a result, Haniyeh resigned on 15 February 2007 as part of the agreement. 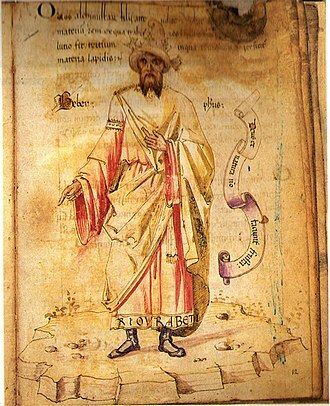 The Medes were an ancient Iranian people who lived in an area known as Media and who spoke the Median language. This allowed new peoples to pass through and settle, in addition Elam, the dominant power in Iran, was suffering a period of severe weakness, as was Babylonia to the west. During the reign of Sinsharishkun the Assyrian empire, which had been in a state of constant civil war since 626 BC, subject peoples, such as the Medes, Chaldeans, Scythians, Cimmerians and Arameans quietly ceased to pay tribute to Assyria. 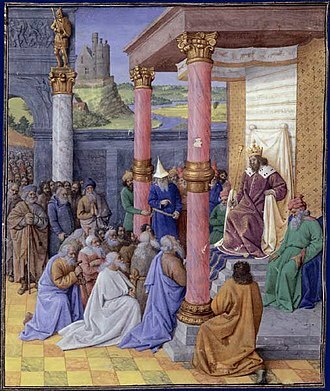 The Median kingdom was conquered in 550 BC by Cyrus the Great. However, nowadays there is doubt whether a united Median empire ever existed. There is no evidence and the story of Herodotus is not supported by sources from the Neo-Assyrian Empire nor the Neo-Babylonian Empire. A few archaeological sites and textual sources provide a documentation of the history. Apart from a few names, the language of the Medes is unknown. The Medes had an Ancient Iranian Religion with a priesthood named as Magi, during the reigns of the last Median kings, the reforms of Zoroaster spread into western Iran. Besides Ecbatana, the other existing in Media were Laodicea. The fourth city of Media was Apamea, near Ecbatana, whose location is now unknown. According to the Histories of Herodotus, there were six Median tribes, Thus Deioces collected the Medes into a nation, now these are the tribes of which they consist, the Busae, the Paretaceni, the Struchates, the Arizanti, the Budii, and the Magi. The six Median tribes resided in Media proper, the triangular shaped area between Ecbatana and Aspadana, in modern Iran, that is the area between Tehran and Hamadan. Of the Median tribes, the Magi resided in Rhaga, modern Tehran and it was a type of sacred caste, which ministered to the spiritual needs of the Medes. The Paretaceni tribe resided in and around Aspadana, modern Isfahan, the Arizanti lived in and around Kashan, the Struchates and the Budii lived in villages in the Median triangle. The original source for different words used to call the Median people, their language, the meaning of this word is not precisely established. Israel and Judah were related Iron Age kingdoms of the ancient Levant. 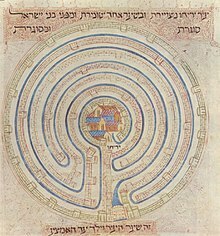 The Kingdom of Israel emerged as an important local power by the 10th century BCE before falling to the Neo-Assyrian Empire in 722 BCE and this, the last nominally independent Judean kingdom, came to an end in 63 BCE with its conquest by Pompey of Rome. 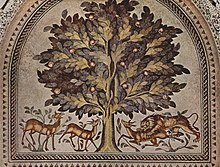 East of the plain and the Shephelah is a ridge, the hill country of Judah in the south, the hill country of Ephraim north of that, Galilee. To the east again lie the valley occupied by the Jordan River, the Dead Sea, and the wadi of the Arabah. Beyond the plateau is the Syrian desert, separating the Levant from Mesopotamia, to the southwest is Egypt, to the northeast Mesopotamia. The location and geographical characteristics of the narrow Levant made the area a battleground among the entities that surrounded it. Politically and culturally it was dominated by Egypt, each city under its own ruler, constantly at odds with its neighbours, and appealing to the Egyptians to adjudicate their differences. 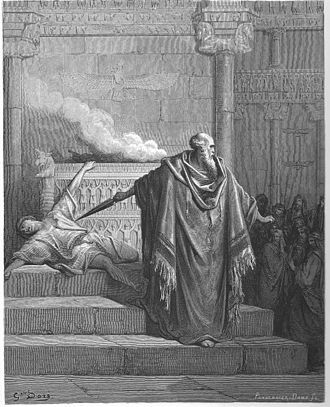 The Canaanite city-state system broke down at the end of the Late Bronze period, the name Israel first appears in the stele of the Egyptian pharaoh Merneptah c.1209 BCE, Israel is laid waste and his seed is no more. In the Late Bronze Age there were no more than about 25 villages in the highlands, the villages were more numerous and larger in the north, and probably shared the highlands with pastoral nomads, who left no remains. 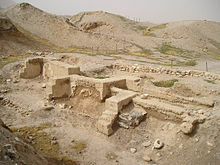 Other Aramaean sites demonstrate a contemporary absence of pig remains at that time, unlike earlier Canaanite, in The Bible Unearthed and Silberman summarised recent studies. They described how, up until 1967, the Israelite heartland in the highlands of western Palestine was virtually an archaeological terra incognita, since then, intensive surveys have examined the traditional territories of the tribes of Judah, Benjamin and Manasseh. These surveys have revealed the emergence of a new culture contrasting with the Philistine. 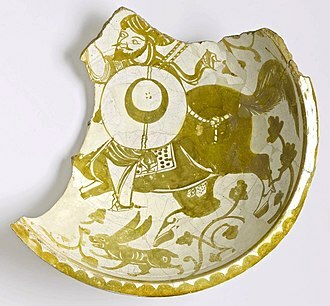 This new culture is characterised by a lack of remains, by an abandonment of the Philistine/Canaanite custom of having highly decorated pottery. The Mamluk Sultanate was a medieval realm spanning Egypt, the Levant, and Hejaz. It lasted from the overthrow of the Ayyubid Dynasty until the Ottoman conquest of Egypt in 1517, historians have traditionally broken the era of Mamlūk rule into two periods—one covering 1250–1382, the other, 1382–1517. Western historians call the former the Baḥrī period and the latter the Burjī due to the dominance of the regimes known by these names during the respective eras. Contemporary Muslim historians refer to the divisions as the Turkish. The Mamlūk state reached its height under Turkic rule with Arabic culture, the sultanates ruling caste was composed of Mamluks, soldiers of predominantly Cuman-Kipchaks, Abkhazian, Oghuz Turks and Georgian slave origin. 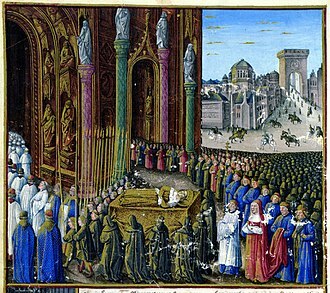 While Mamluks were purchased, their status was above ordinary slaves, Mamluks were considered to be true lords, with social status above citizens of Egypt. Though it declined towards the end of its existence, at its height the sultanate represented the zenith of medieval Egyptian and Levantine political, the term Mamluk Sultanate is a modern historiographical term. 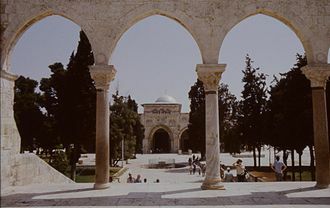 The Arabic sources for the period of the Bahri Mamluks refer to the dynasty as the State/Realm of the Turks, other official names used were State of the Circassians. A variant thereof emphasized the fact that the Circassians were Turkish-speaking, the term Mongol State was used during Sultan al-Adil Kitbughas rule, who was of Mongol extraction. Dawlatāl Qalāwūn or Dawlat Banī Qalāwūn which means Qalāwūnī State/Dynasty which have ruled for hundred years between 1279 and 1382, al-dawla al-Ẓāhiriyya which meant Ẓāhirī state/dynasty which is the dynasty of Baibars and his two sons al-Said Barakah and Solamish. This dynasty have ruled consecutively for 19 years, Mamluk was a term defined as owned slave, distinguishing the mamluk from the garya and ghulam, which referred to household slaves. After thorough training in fields such as martial arts, court etiquette and Islamic sciences. However, they were expected to remain loyal to their master. 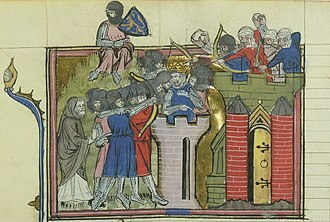 Mamluks had formed a part of the state or military apparatus in Syria and Egypt since at least the 9th century, each Ayyubid sultan and high-ranking emir had a private mamluk corps. A Roman copy of a Greek statue of Seleucus I found in Herculaneum. Now located at the Naples National Archaeological Museum. 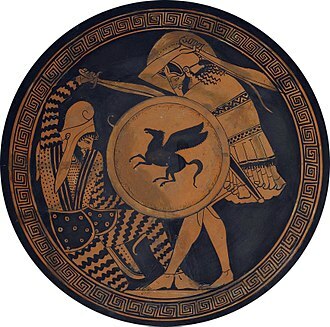 Seleucus led the Royal Hypaspistai during Alexander's Persian campaign. 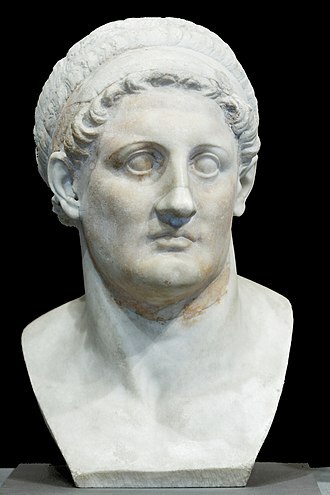 Ptolemy, an officer under Alexander the Great, was nominated as the satrap of Egypt. Ptolemy made Egypt independent and proclaimed himself King and Pharaoh. Dome of the Rock on the Temple Mount, Jerusalem was built by the Caliph Abd al Malik in 691, making it the oldest extant Islamic building in the world. 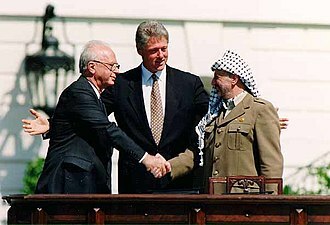 Yitzhak Rabin, Bill Clinton and Yasser Arafat at the Oslo Accords signing ceremony on 13 September 1993. Mahmoud Abbas (Abu Mazen), President of the Palestinian Authority since 2005 (disputed since 2009). Israeli soldiers in Bethlehem (Israeli Military Governorate) in 1978.